The title: ‘Dark Night of the Soul’ partly did it for me. Then there was the recommendation from ‘Paste’ magazine. 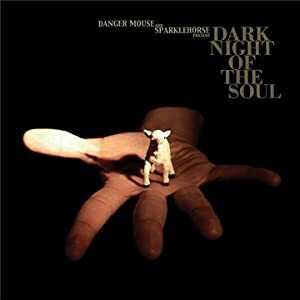 Then the artists: Danger Mouse and Sparklehorse (Mark Linkous relatively recently took his own life). Then the collaborators: Gruff Rhys, Suzanne Vega (yes, really), Iggy Pop, the Flaming Lips and more. It’s still new to me, so at the moment it feels like swimming in a large warm ocean with plenty more still to discover. But what is not to love with titles like ‘Just War’, ‘Pain’, ‘Man who played God’, ‘Grim Augury’ and ‘Dark Night of the Soul’? I won’t describe the genre; lets just say it won’t be the soundtrack of carefree summer barbeques, unless the barbeque sets light to your house, freak lightning incinerates half your guests, your significant other deserts you and you break a limb.